On December 28, 2017, a protest began on the streets of Mashhad that triggered an uprising that continues on eight months later. This new wave of protests has been marked by continuity. But the uprising can be divided into three main phases. Mojahedin.org reported on the three phases of the current uprising taking place in Iran. The first phase started on December 28, 2017 with a protest about inflation. It quickly mutated into a series of anti-government protests targeting the regime as a whole. The protests lasted until January 6, 2018. Though the uprising has ebbed and flowed, it has continued in one form or another since then. The second phase of the uprising started in March 2018, at the beginning of the Iranian New Year. The Ahwazi Arabs began protesting on March 28, 2018. 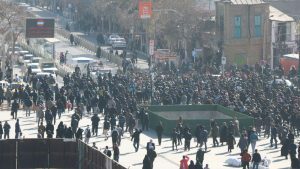 The farmers of Isfahan took to the streets after the start of the new year, taking the lead in the uprising. The farmers had already begun protesting for water rights before the beginning of the new year. The authorities cracked down on the farmers, making widespread arrests. On April 14th, the people of Kazerun began weeks of protests for freedom. Four protesters were killed when security forces opened fire upon a crowd of protesters in May. On May 10th, teachers went on a nationwide strike in 34 cities across Iran. Their strike had a major impact on the next events in the uprising. The border city bazaars went on strike in April and May, and on May 14th the strikes spread to Tehran’s Grand Bazaar and then to other cities. On May 22nd, Iran’s truckers began a nationwide strike that spread to almost every province in the country. The strike had a deep impact on the regime. The strikes were widespread, highly visible, difficult to suppress, and enjoyed popular support. The truck drivers strikes drew a great deal of attention to the regime’s incompetence. On July 23rd, Iran’s truck driver’s began their second round of strikes. The regime made a number of concessions and promises for reform after the first round of strikes, but most of these had gone unfulfilled. On July 31st, the industrial workers of the Shapur district in Isfahan were joined by other citizens of Isfahan in a grand uprising after the plunge in value of the rial. The uprising quickly spread to a number of other cities, including Shiraz, Karaj, Arak, Mashhad, and Tehran. Calls for regime change were reported by the MEK network inside Iran within the first day of protests. The third phase of the Iranian uprising is currently in progress. Protesters are asking for the same things they have asked for in past uprisings: Freedom, economic opportunity, human rights, and a free and democratic government. Since the mullahs took power in the 1979 revolution, there have been a number of protests and uprisings. These protests and uprisings may be organized into three major cycles. 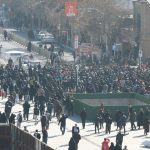 These protests consisted mostly of students and resulted from an internal power struggle between “reformists” and conservatives within the Iranian regime. Protesters hoped to find a solution within the existing political system. These protests included the middle and upper classes of Iran and also resulted from internal struggles between “moderates” and conservatives. In contrast to the 1999 protests, the 2009 protests were not limited to students and included Iranians of different education levels, ethnicities, and origins. The protests were widespread, including virtually every major city. And while protesters initially hoped to find a solution within the system, as the protests grew and spread, that hope was abandoned and the protesters turned on the regime as a whole. The ongoing uprising is fundamentally different in nature from past protest movements. These difference could lead to its eventual success in overthrowing the regime. Protesters are looking outside of the system for answers. The Iranian people have learned that the myth of the moderate is a lie. Rouhani promised reform during the election and has failed to follow through on a single promise. The MEK network has repeatedly reported chants of “Moderates, conservatives, the game is over!” at protests. Protests on issues as diverse as water access and economic stability turn to calls for regime change within hours. The people are done with the lie that “moderates” are willing or able to change the system. Second, the current uprising is unprecedented in its duration. The uprising has lasted for over eight months. In the almost 40 years of the mullahs’ rule, no wave of protests has ever lasted this long. This is despite the brutal crackdown by the regime. Finally, the Iranian regime is in a tailspin due to its corruption, mismanagement, incompetence, and sanctions. In the past, the mullahs have been able to use oil profits to cover for their incompetence. But the economy is no longer able to sustain decades of mismanagement. Experts estimate Iran’s inflation rate is between 100-200 percent per year, and the rial has dropped 100 percent in value against the U.S. dollar in the past six months alone. With the economy in free fall, the mullahs may have lost any leverage they once had to deal with dissent from the people. The people are no longer afraid of the regime’s security forces. Phase three may be the final phase of the uprising.